When a battle with death-dealing Skinners catapults Daine and her mentor, Numair, into the divine realms, the riddles of Daine’s past finally begin to reveal themselves. However, the pair must return to their beloved Tortall, for the kingdom is under attack and survival depends on Daine’s wild magic. A harrowing journey across the divine realms leads Daine and Numair through danger to dragons; to a breathtaking confrontation with their great enemy Ozorne; and finally brings Daine face to face with the Great Gods, who will force the girl to make the most important decision of her life. Filled with breathtaking peril, lightened by deft moments of comedy (wait till you meet the darkings! ), The Realms of the Gods is a fitting conclusion to one of the great fantasy series of our time. 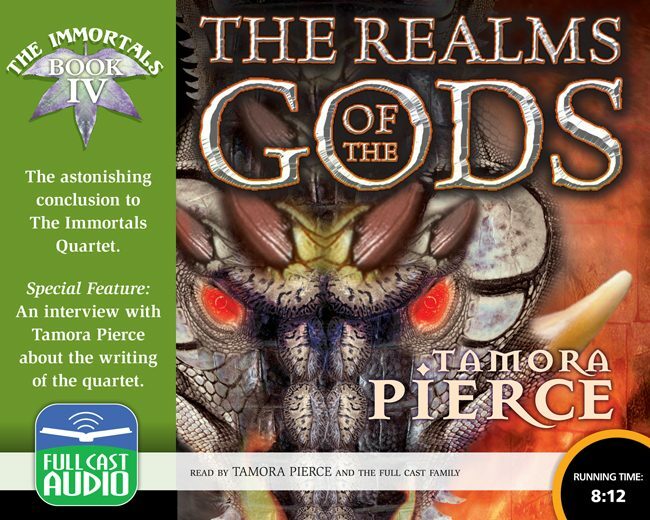 An exclusive interview with Tamora Pierce about writing The Immortals Quartet concludes the recording.